Linfield are back on the Premiership summit and they had the look of potential champions in a one-sided encounter against 10-man Warrenpoint, The Blues are three points clear and remain unbeaten after six games while Town still have the dreaded zero in the points column. 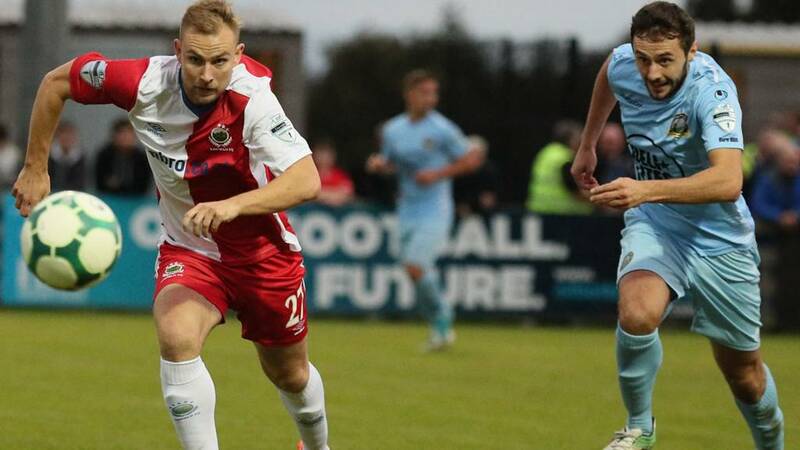 There was a return to form for Cliftonville as Joe Gormley's double helped them to a comfortable win over Institute while Dylan Davidson's cracker was the highlight as Glentoran beat Newry to move into third place. Thanks for your company and we'll back with more Premiership action next weekend. We were excellent - this was a test of attitude and we got it spot-on. Our defence has been pleasing and the new players have adapted well. It's only a start but there's a good buzz here at the minute which is good for the management. I'm delighted with the performance and our first clean sheet of the season. We had the work ethic and attitude that we didn't have last week. We we very professional and stayed resolute to our game-plan. Curtis Allen, Robbie McDaid, Marcus Kane and brilliantly Dylan Davidson on target for Glentoran. Conall Delaney got Newry's goal. Two for Joe Gormley after Ryan Curran's opener as Cliftonville get their second win of the league campaign. It was a complete performance from Linfield. One of the criticisms last season was their lack of creativity from open play but they had that tonight. It was too much for Warrenpoint to cope with and it was one easiest games Linfield have had in a long time. Newry get a penalty right at the end, awarded against Calum Birney for climbing all over an opponent. But Stephen Hughes cannot make it count as home keeper Elliott Morris touches it onto the post. It was the last kick of the game. The rout is complete as substitute Andrew Waterworth slots in with a minute left. The striker beats keeper Beerat Turker in a race for the ball and has the simple task of tapping into an empty net. David Healy's men are going three points clear at the top! A peach of a volley by Dylan Davidson puts the icing on the cake for Glentoran. The substitute had only been on the pitch for about 20 seconds. One touch to control, followed by a brilliant left-foot strike from at least 30 yards out. Nine minutes left at the Oval. More goals to come for Blues? Linfield have come out tonight and shown a good attitude - I expect them to score more goals. David Healy will want his team to play the game out now and just be professional. Joe Gormley heads in his second of the night and it's curtains for Institute. Jaimie McGovern delivered from the right and there was Gormley in the middle to head downwards and into the corner. Cliftonvillle's second league win of the season appears to be signed, sealed, delivered. Skipper Marcus Kane restores Glentoran's two-goal advantage on the hour by heading home from Ross Redman's corner from the right. City supremo Darren Mullen will be asking questions about the marking there. See how Conall Delaney got Newry back into the game away to Glentoran early in the second half. Andrew Mitchell tucks away the penalty and this match is done and dusted. Beerat Turker replaced dismissed keeper Adam McCarey in the Town goal and his first touch is retrieving the ball from the back of the net. Linfield are going top while it's a case of more misery for bottom side Warrenpoint. Town keeper Adam McCarey is sent-off on his debut for a foul on Joel Cooper and the Blues have a penalty. Michael O'Connor stabs in a third for the Blues after 53 minutes. The striker hits the the underside crossbar and net the rebound.